Use these stylish hexagonal display cabinets to showcase your collectibles. Our free-standing curio cabinets use tempered glass for a full view showcase. These hexagonal display cabinets, display cases are free standing displays. Curio cabinets from this line showcase a unique design, but what's different about them? They omit the base and canopy for a minimalist frame effect. They have a locking hinged door to secure a jewelry, trophy, antique, china, artifact, or other collection. These hexagonal display cabinets are easy to relocate, and their versatile facade maintains visibility when placed against a wall. How do I decide among these wall-independent showcase models? DisplayCabinets2go.com specializes in display cases. Our hexagonal curio cabinets have four 50 watt halogen lights and a mirrored deck. Side track lights are optionally accessible. An exterior electrical switch controls the lighting system. These curio cabinets come with five adjustable glass shelves, each a quarter inch thick. These curio cabinets are accessible trimmed in black or silver polished metal, or cherry, maple, rosewood, or oak wood finish. Wheels provide mobility for these display cases. 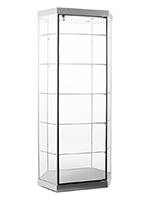 These curio cabinets, wide view display cases, glide with comfort. Perfect for museums, restaurants, schools, corporate visitor areas, or home dens, display cases like these are in high demand. No matter what you want to showcase, these hexagonal walk-around glass towers accomplish it elegantly.